On today's show we have Byron Chen. Byron was born in Lincoln, Nebraska, and grew up in Edison, New Jersey. He graduated from the United States Naval Academy in Annapolis, Maryland, and served as an officer in the United States Marine Corps. His six years of active duty included a deployment to Iraq, multiple company commands, and a tour at the prestigious Marine Corps Recruit Depot in San Diego. After leaving the military, Byron drew on his lessons in management, team building and problem solving in high pressure environments to consult with entrepreneurs on business development, marketing and sales. He also helps companies with recruiting talented veterans to their workforce. He is actively involved in supporting veterans causes and provides resources to service members on his blog, SuccessVets.com, with articles, videos and podcasts. 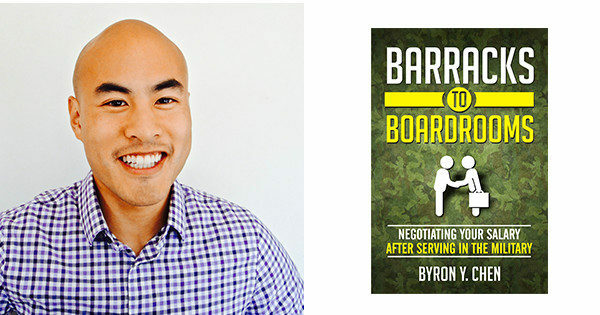 Today we talk about Byron's new book Barracks to Boardrooms and dive into the events that led up to him writing his book, taking the entrepreneurial leap by quitting his job to travel and start his new ventures. Barracks to Boardrooms is available on Amazon now and we dig into some great advice from the book on salary negotiations, how and when is the right time to approach your employer and what Not to do as well. People lose out on thousands of dollars every year because they didn't negotiate.